A Note from The Pancreas Center: We would like to express our wholehearted thanks for all the great work Geri has done for our patients and our program. She has consistently shown herself to be a loyal and hard working, integral part of the team. She has made a remarkable contribution to the lives of those we have cared for at The Pancreas Center. Geri, you will be sorely missed and we wish you a long, happy and healthy retirement! 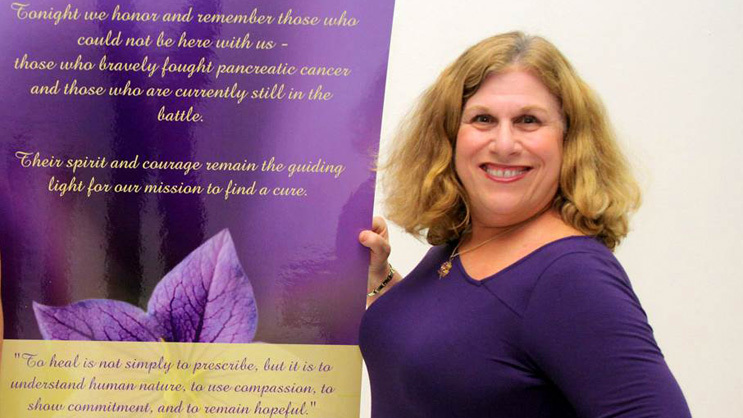 My name is Geri and for the past 2 & 1/2 years , I have been the facilitator of the monthly Pancreas Cancer Support Group. This group has been a very important part of my professional self here at Columbia/NYP. As a social worker, this group has provided me with a great deal of insight and understanding about the patients and their caregivers. The group has followed a psycho- educational model- the first half of the meeting there usually was a guest speaker who presented and during the second half , the members shared. The speakers have been doctors, researchers, chaplains, nutritionists, and specialists in alternative medicine techniques such as yoga, meditation, acupuncture, and reiki, just to mention a few. We always stress the positive – that the glass is half full - and encourage a very strong all in the fight against pancreatic cancer – HOPE. We always try to present the idea that at the moment a person is diagnosed with cancer, he/she IS a survivor – and not defined by this disease. Patients and their caregivers found this group to be a "safe" place to share feelings and fears, and often sometimes these feelings had nothing to do with pancreatic cancer. I have witnessed an outpouring of support and encouragement for all who attend, often times complete strangers to each other. I will be retiring on May 31,2016. I look at the relationships that have been made because of this group People connect outside the meeting place. They share, they laugh and they cry together. They share HOPE. I will remember the patients and their caregivers of this group as people having such great inner strengths and positive attitudes. They are warriors who never give up HOPE. I feel that because of this group, I have grown both professionally and personally. The feelings of HOPE which are always prevalent at the meetings will also be with me forever.